A friend sprung this project on us at nearly the last minute...he wanted a light-up mohawk on his Viking helmet. Fortunately he already had the helmet, and we already had plenty of LEDs and raw materials. The main obstacle turned out to be the fiber optics. We discussed several options; it's pretty easy to locate bulk art-grade fiber optic spools, but cutting a few thousand fibers didn't sound like a feasible task considering less than a week remaining (plus lots of other tasks demanding spare time after work). And we had no way to easily tell how stiff the fiber was, or if it would try to curl up. I remembered seeing street vendors selling light-up wands with fiber optics. They proved to be a cheap source of premade fiber bundles of the correct length and stiffness, already clamped into a handy ferrule. I didn't have time to hunt down a street vendor, so found a source of cheap bulk wands at FlashingBlinkyLights.com. The price for just the optics was acceptable, not even counting the rest of the handle, batteries, LEDs, etc. This needed to be compact, and the helmet needed to be audio reactive too, so I also grabbed some parts from Sparkfun: Arduino Pro Mini, Electret Mic Breakout, and MSGEQ7 Spectrum Analyzer. Also needed a tiny case and some battery holders, got those from Jameco. Submitted by Garrett on Wed, 08/31/2011 - 18:27. It's been a week since the latest Maker Faire in San Mateo. We're still recovering from the effort of putting together our project, talking to thousands of curious Maker Faire visitors, and meeting all the famous (well, maker-famous) people we usually only see on the internet. As always, the weeks leading up to Maker Faire were a frenzy of activity. For some reason, at macetech we have an aversion to bringing the same major project twice. We'll re-use some of the smaller ones, if they're still around, but the big project always has to be built from scratch and nothing like last year's project. Submitted by Garrett on Sat, 05/28/2011 - 17:08. Know Processing? Please help us with Maker Faire! Only ten days to Maker Faire as I am writing this! That's why I need your help. Well...I need your help if you like hacking around in Processing, making neat looking graphical effects. Our major project for Maker Faire this year is an overhead matrix of Chinese lanterns, lit by new versions of our Satellite Modules and a new controller. There will be 128 lanterns laid out in a 16x8 matrix, inside a 20x10 foot canopy. 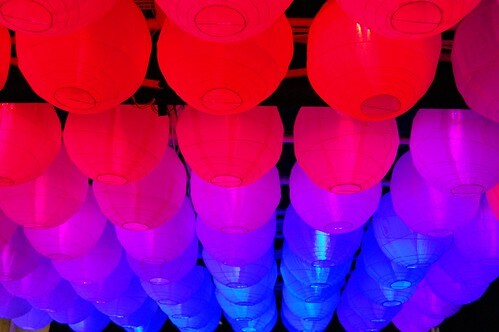 The lanterns will react to music and we'll let the audience select visualizations and hopefully interact in other ways. It's going to look awesome! Therefore...I'm hoping that a few helpful Processing dabblers could download my existing code and try making some new effects. I've wrapped it all up in a matrix simulator as you can see in the Youtube video. Simply draw the effect in the upper 320x160 area, and it will be pixelized in the bottom half. The pixelized area is what will be sent to the LEDs, so I need effects that look good in the pixel area too. I have FFT and beat detection all set up, you just need to hook your ideas into that. Stuff with bright colors, simple shapes, and computationally forgiving will work best. Easy! Submitted by Garrett on Wed, 05/11/2011 - 18:07. SOLUTION: Install a light above the sink. BONUS ROUND: Build the light from parts I already had, and make it automatically turn itself on and off. I decided to build it using stuff from around the house. Of course, this isn't just any house...this is a geek house! So the components below were naturally considered household items. I decided to use an ATtiny84 as the heart of the project. It's way under-utilized here, but I didn't have any ATtiny25s in stock. I could have used a 555 instead of a microcontroller, but then I wouldn't have gotten a cool fade-in and fade-out PWM effect. Plus the 555 at one minute or higher time scales is a little ungainly, with the high value capacitor required. And I REALLY wanted a smooth fade-in. I would have also needed to invert the trigger signal from the PIR sensor. Submitted by Garrett on Sat, 03/05/2011 - 23:23. SparkFun is doing it again! Tomorrow (January 13th, 2011) they will be giving away $150,000 worth of free electronics hardware to whoever is lucky enough to access their servers during the inevitable Internet stampede on their website. We talked to a couple of their IT people at Maker Faire New York, and they're optimistic about the steps they were planning even four months ago...still, it'll be an amazing accomplishment if their site weathers the storm unaffected. In any case, we hope that some of you electronics hobbyists out there manage to place your order, and get some cool stuff for your next project. Remember that several macetech products are available at SparkFun: the ShiftBrite, MegaBrite, ShiftBar, and Satellite Module 001. If you snag some of our products during Free Day, feel free to contact us for any help you need getting your LED product blinking and glowing. Submitted by Garrett on Wed, 01/12/2011 - 16:01. A friend was having birthday party late yesterday, to coincide with viewing the total lunar eclipse. That evening I realized there was quite a lot of cloud cover, and it was cold outside. 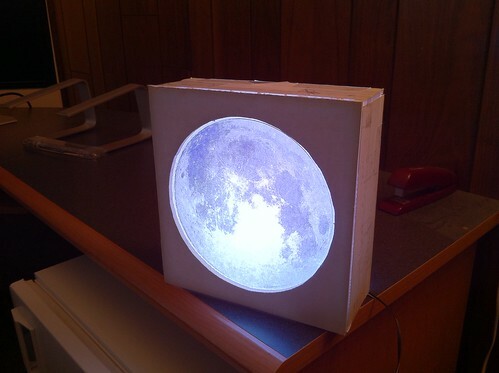 I decided to build a moon simulator so that we could keep an eye on the eclipse regardless of the weather. Submitted by Garrett on Tue, 12/21/2010 - 18:09. We got our Christmas project done a bit later than usual this year, but here it is. An eight-foot wooden triangle filled with 51 MegaBrite RGB LED modules, controlled by an Arduino. As our projects always do...this also lights the houses across the street pretty well, running about 75 watts of LEDs maximum. Unfortunately didn't take photos during construction, but it's nothing too difficult. Three 1x4 planks fastened at the corners with metal brackets, 3/4 square dowel cross beams, and lots of zip ties. The MegaBrites are daisy chained from a bottom corner up to the top in a zig-zag pattern. Power is connected every 7 or 8 modules, to a 7.5V 20A Meanwell supply from Jameco. For rain protection and a little diffusion, the whole thing is wrapped in a 2mil plastic drop cloth. Submitted by Garrett on Sat, 12/18/2010 - 22:51. We've been busy developing new products and dealing with a few supply problems, so it's been a while since the last project roundup post. There have been almost too many to list, though we will get to them eventually. For now, here are two high-profile lighting projects that have involved our technology. The always popular band OK GO recently released another video that is becoming an internet sensation; about 125,000 view on YouTube since it was posted five days ago. The band led a street parade through Los Angeles, using a GPS app to spell OK GO using their route. 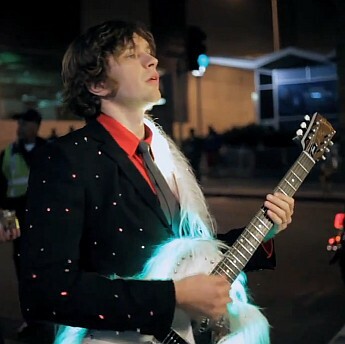 The parade started in daylight and continued into the night, and members of the parade were encouraged to decorate their clothing and instruments with anything that would light up. Submitted by Garrett on Fri, 12/17/2010 - 01:34. It was recently brought to our attention that the current production batch of OctoBrite DEFILIPPI was manufactured with a faulty component. 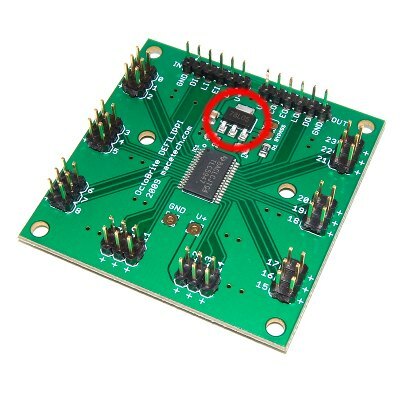 The 78L05 "regulator" (circled below) is NOT behaving like a regulator and will in fact allow overvoltage into the TLC5947 chip, causing failure. We had not received any word of OctoBrite DEFILIPPI failing until now, we think due to the fact that most OctoBrite users have been primarily testing with lower LED voltages. OctoBrites manufactured before June (with regulator oriented the opposite direction) are not affected by this issue. We are not sure what this part actually is, but we believe it is mismarked or counterfeit. It seems hard to believe that someone would counterfeit such a cheap part, but there's no other explanation that makes sense; our assembler arrived at the same conclusion. Ship the OctoBrite back to macetech for repair. We can easily replace the regulator and ship it back; you should experience no more than 2-3 days in addition to shipping time round trip. It's still a relatively slow solution, especially for international customers, but the most reliable. If your OctoBrite TLC5947 chip has already been damaged, we recommend this option. Please contact us before shipping any devices. Submitted by Garrett on Mon, 11/08/2010 - 23:18. Was running out of ideas for a Halloween costume, and fell back on the old standby "Mad Scientist". I mean, I have all the stuff already :) The sad part is for the past couple years I've spent so much time working on a really awesome costume, I didn't actually go anywhere! Two great robot costumes, never to be seen...one even had an Arduino-powered voice changer. *Maybe* this year will be different, assuming I don't think of some last minute enhancement that takes another week. 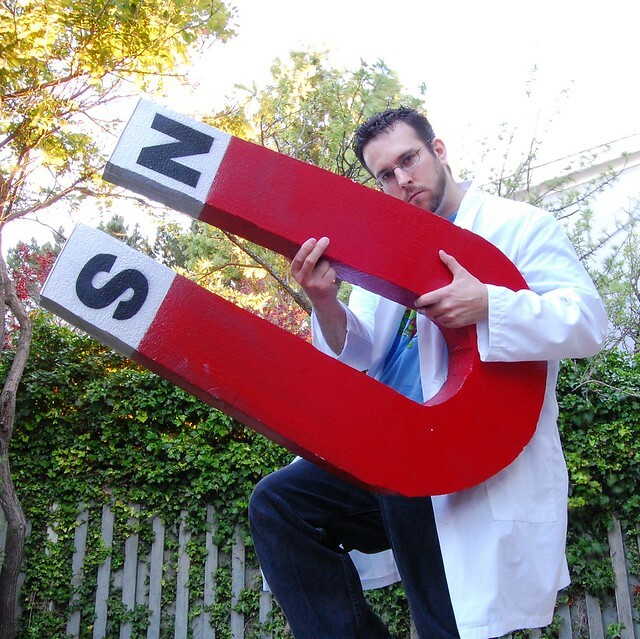 So I had the lab coat and magnet already. The idea was to hang out next to the line for the Insane Clown Posse when they had a concert in town, around the time of the whole "Miracles" meme. I built the giant magnet out of two layers of 2" styrofoam insulation panel from Home Depot. Did not have a hot wire foam cutter, so I made one by running about 20 amps through a piece of 28 gauge magnet wire. So I wanted to use the magnet for the mad scientist costume this weekend, but thought it needed a little more pizazz. Also, some bracing across the ends so it wouldn't get crushed and broken. A piece of clear acrylic seemed like a good idea. Then, I realized that the acrylic could have more than just a structural function. 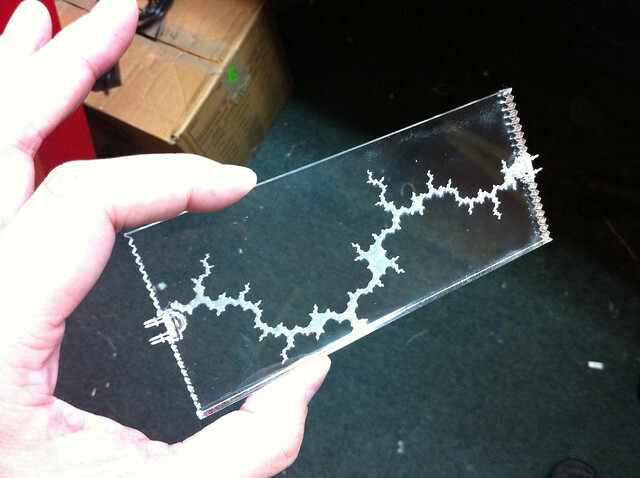 I called up TechShop and reserved some laser time, and etched fractal lightning patterns on three panels. Submitted by Garrett on Sat, 10/30/2010 - 00:57.